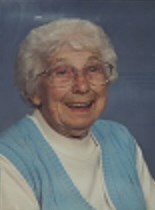 Ellsworth — Ella C. Brown, 101, died peacefully October 5, 2018 at Courtland Rehab. and Living Center, Ellsworth. She was born September 1, 1917 in Gouldsboro, ME the daughter of Lewis and Evelyn (Matthew) Clinkard . Ella moved to Ellsworth, Maine in 1962 and married Henry J Brown in 1963 who predeceased her in 1972. She babysat for several families in Ellsworth for many years. Ella ended her career working as a dessert cook at Maine Coast Memorial Hospital in Ellsworth. She is remembered by most as the sweet little lady crossing High Street. She loved visiting her niece, Rhonda Curran, in Orlando Florida and visited every year until her mid 90’s. Her favorite place to visit was the Alligator Farm where she was fearless of holding alligators and large snakes wrapped around her neck. She treasured her visits with her niece and loved spending time with Rhonda and her husband, Kevin and their two children, Justin & Ashlee. She adored her great-great nephew, Caleb Scott Curran. She loved reading books to him and watching him play. Ella is survived by a brother, Lester Conners, of Massachusetts: niece, Rhonda Curran and husband Kevin, of Orland and their son Justin and wife Alison of Simpsonville South Carolina, and daughter Ashlee of Orland and her son Caleb. Ella’s love for life always shined. She was loved by so many and will be greatly missed by all. A graveside service will be held 10 am, Saturday, October 13, 2018 at Woodbine Cemetery, Ellsworth. Arrangements in care of Acadia Burial and Cremation Direct, 248 State St., Ellsworth. Rest in peace my sweet Ella. I love you. I will hold close to my heart the special times we spent together. Ella was a very special lady! For many years, she babysat my daughter, Mary Beth and was so good to her. I have fond memories visiting Ella and having tea and chatting with her about everything! Ella touched our hearts and will never be forgotten. She was such a sweet and loving person!